Virent’s BioForming® platform is based on a novel combination of Aqueous Phase Reforming (APR) technology with modified conventional catalytic processing. The APR technology was discovered at the University of Wisconsin in 2001 by Virent’s co-founder and chief technology officer, Dr. Randy Cortright. The BioForming platform expands the utility of the APR process by combining APR with catalysts and reactor systems similar to those found in standard petroleum oil refineries and petrochemical complexes. 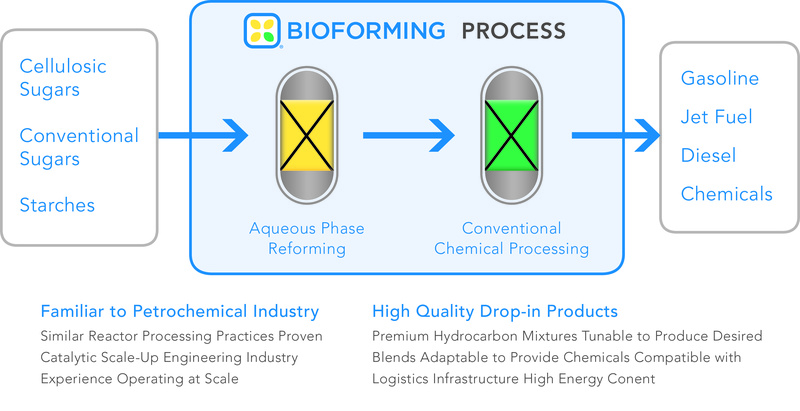 The BioForming process converts aqueous carbohydrate solutions into mixtures of “drop-in” hydrocarbons. The process has been demonstrated with conventional sugars obtained from existing sugar sources (corn wet mills, sugarcane mills, etc.) as well as a wide variety of cellulosic biomass from nonfood sources. The process can accommodate a broad range of compounds derived from biomass, including C5/C6 sugars, polysaccharides, organic acids, furfurals and other degradation products generated from the deconstruction of biomass. The soluble carbohydrate streams can consist of a wide range of molecules as depicted below and are processed through the aqueous phase reforming step. The aqueous phase reforming step utilizes heterogeneous catalysts at moderate temperatures and pressures to reduce the oxygen content of the carbohydrate feedstock. Some of the reactions in the APR step include: (1) reforming to generate hydrogen; (2) dehydrogenation of alcohols/hydrogenation of carbonyls; (3) deoxygenation reactions; (4) hydrogenolysis; and (5) cyclization. Representative APR reactant and product molecules. A key advantage to the BioForming process is the ability to produce hydrogen in-situ from the carbohydrate feedstock or utilize other sources of hydrogen such as natural gas for higher yields and lower costs. The product from the APR step is a mixture of chemical intermediates including alcohols, ketones, acids, furans, paraffins and other oxygenated hydrocarbons. Once these intermediate compounds are formed they can undergo further catalytic processing to generate a cost-effective mixture of nonoxygenated hydrocarbons. The chemical intermediates from the APR step can be reacted over a Virent modified ZSM-5 catalyst to produce a high-octane gasoline blendstock that has a high aromatic content similar to a petroleum-derived reformate stream. Virent has trademarked this product BioFormate™. The chemical intermediates from the APR step can also be converted into distillate range hydrocarbon components through a condensation step followed by conventional hydrotreating. All of Virent’s hydrocarbon products from the BioForming processes are “drop-ins” for petroleum fuels and petrochemicals. Virent’s hydrocarbon molecules are the same as those found in today’s petroleum products, but from renewable feedstocks. These molecules can be dropped in to existing infrastructure for the production of chemicals or blended in high concentrations to make premium quality gasoline, diesel or jet fuel with global market acceptance. Because our molecules are the same as those derived from petroleum, switching to or adding our renewable fuels or chemicals is a seamless and cost effective process. Virent’s BioForming process accommodates the renewable feedstocks our customers require, based on their preferences for source, price, emissions targets, geographic location, availability or other obligation. Unlike finite fossil fuels, Virent’s feedstocks are renewable and domestically grown, which results in rural development, energy independence and economic security. The BioForming process is energy efficient, water positive and has low life-cycle carbon emissions and improved life-cycle emissions relative to fuels from crude oil. The BioForming process allows for efficient system heat integration along with reduced energy inputs as it produces hydrocarbon products that naturally separate from water. The energy efficiency of the process allows for reductions in carbon life-cycle emissions with more biomass options and lower input costs. 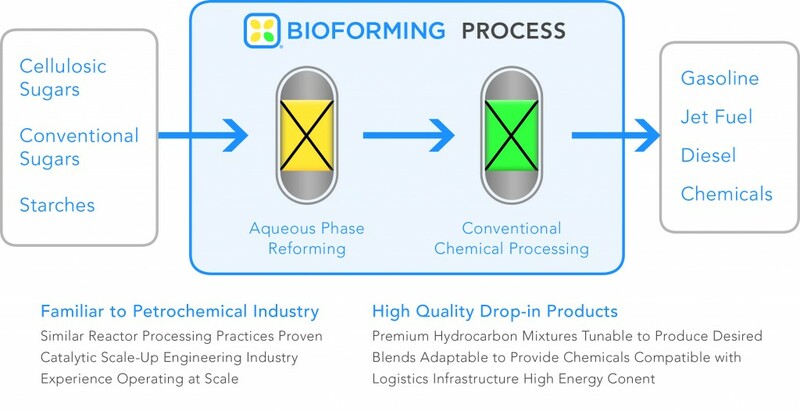 The BioForming technology is a continuous, high throughput process that can leverage existing milling and refining assets, resulting in lower capital requirements for deployment. The catalysts used in the BioForming process provide increased productivity due to faster, continuous chemical reactions, feedstock flexibility, proven process reliability, reduced energy requirements and demonstrated scalability to large production volumes. The process closely resembles catalytic processes now used in petroleum refining, leading to greater probability of acceptance and greater potential for scalability than competing technology pathways. How can Virent’s BioForming process help reduce your company’s dependence on crude oil?